Lisa Kerney is an American news and sports journalist. She is best known for her outstanding work as a sportscaster on ESPN. Full name-Lisa Diane Gangel Kerney was born on July 8, 1981, in Kansas City, Missouri, U.S. She is a graduate of Lynn University in Boca Raton, Florida, where she majored in broadcast communications. Kerney attended the school on a basketball scholarship and rose to become a point guard and captain of the team. 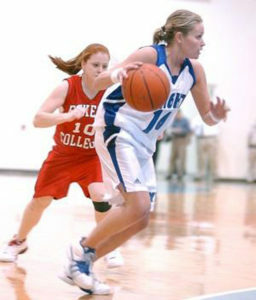 She was the Scholar Athlete of the Year in her junior and senior year and gained her bachelor's degree in May 2004. Lisa Kerney is currently working for the channel "ESPN" as a sportscaster. Initially, she joined ESPN as a studio anchor on February 2014, appearing on various shows across several ESPN platforms. 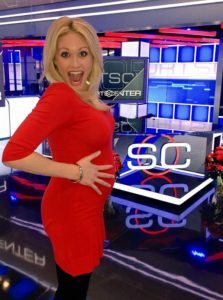 As of now, she is one of the most reputed anchors of the evening and night editions of SportsCenter. Prior to joining ESPN, Kerney was at KING-TV in Seattle, where she used to work as weekend sports anchor and Northwest Sports Tonight host from October 2005-2010. KING-TV, channel 5, is an NBC-affiliated television station located in Seattle, Washington, United States. She had also been on MLB Network, where she was a sports contributor /reporter from October 2010-December 2011. 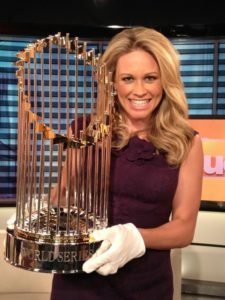 After a year working at MLB Network, she transitioned to "WCBS-TV" in New York, where she was the sports reporter for CBS 2 News "This Morning" since January 2012. WCBS-TV is owned by the CBS Television Stations division of CBS Corporation. It operates as part of a television duopoly with Riverhead, Long Island-licensed independent station WLNY-TV. She was also responsible for the national highlight segment of The Jim Mora Show, which aired after every Seattle Seahawks game." She is a member The Leadership Society and the President's Alumni Advisory Council at Lynn. She received the Montana Standard 2005 People’s Choice Awards: Top Choice for “Best Sports Reporter,” and “Best TV Personality,” when she was the sports producer/reporter/anchor at KXLF-TV in Butte (September 2004-05). Lisa Kerney is a happily married woman. She and her husband Patrick Kerney has been married since June 2010. Patrick is a former American football defensive end, who played in the National Football League (NFL) for eleven seasons. Lisa Kerney met her husband Patrick Kerney when she was covering a sports conference, where the couple got introduced for the first time. It was during 2007 when Lisa was covering a Seahawks press conference in which Patrick was introduced as a new Seahawks player. In the same conference, Lisa asked for a one-on-one extended interview with Patrick to air on a regional sports show. They soon fell in love with each other. Lisa Kerney and Patrick Kerney began their relationship for few years and ended up tying a knot in June 2010. The couple currently has four children. On 2014 Christmas day, Lisa Kerney revealed via twitter that she was pregnant for the third time and gave birth to twins baby daughter. Lisa Kerney, 6'0", is active on social networking sites like Twitter and Instagram. This 36 years old journalist is no less than other popular and wealthy Journalists around the globe. Her estimated net worth is $14.8 Million. She holds an American nationality and belongs to white ethnicity.